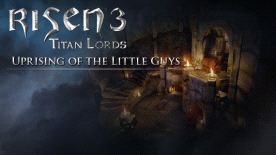 This product requires the base game Risen 3 - Titan Lords Complete Edition. © 2014 by Koch Media GmbH, Gewerbegebiet 1, 6604 Höfen, Austria. Deep Silver is a division of Koch Media GmbH. Developed by Piranha Bytes, Deep Silver and their respective logos are trademarks of Koch Media. All other trademarks, logos and copyrights are property of their respective owners. All rights reserved. Microsoft, Xbox, Xbox 360, and the Xbox logos are trademarks of the Microsoft group of companies and are used under license from Microsoft. "PlayStation" and the "PS" Family logo are registered trademarks and "PS3" is a trademark of Sony Computer Entertainment Inc. The PlayStation Network Logo is a service mark of Sony Computer Entertainment Inc. All other marks and trademarks are the property of their respective owners. All rights reserved. Requires Risen 3: Titan Lords (base game) to use this DLC.